Liz Wolfe | Are there alligators in your way? Last month I went to a stimulating business conference in Orlando. Surprisingly, the most memorable learning experience for me came out of a nature walk I took on the hotel grounds. I discovered the hotel had a nature trail on its extensive grounds when I first arrived. Getting to the path seemed straightforward enough on the hotel’s map, so I decided to walk it the next morning as a way to start my day. I imagined that I would get fresh air and exercise while enjoying nature and becoming grounded. With this clear vision in mind, I ventured out into the chilly Florida morning. Not quite sure where to go, I asked a man who worked there how to get to the trail. I was taken aback when he said, “Well, we don’t recommend that you walk there, because there are alligators and snakes.” Immediately doubt set in. Should I still go? 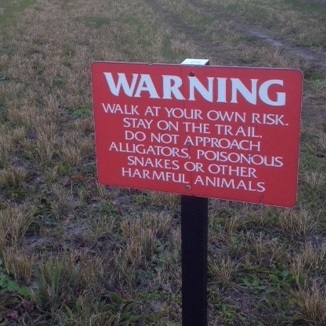 I sure didn’t fancy meeting up with an alligator. Suddenly the vision of my walk turned from being filled with peace and joy to fighting a losing battle with a creature whose jaw was longer than my body. I decided to continue anyway, albeit with some trepidation. Almost 45 minutes later, I still couldn’t find the entrance to the trail. Completely frustrated, I returned to my room. The next morning I was determined to try again. At least I knew where the trail wasn’t. After asking for more help, I finally found it. 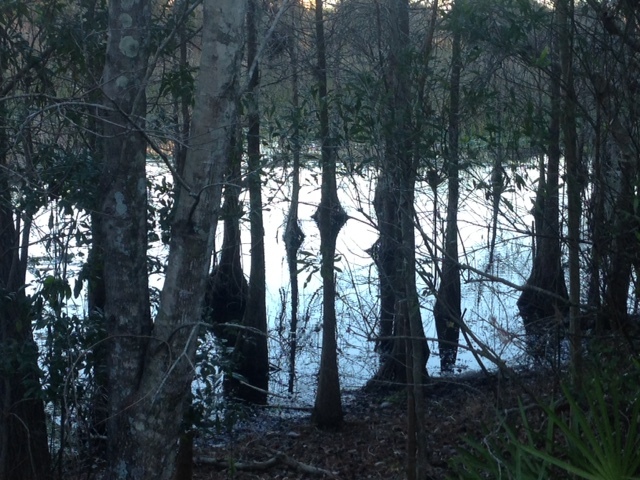 The first thing I saw on the trail was a sign warning me about the alligators. As I walked the wide grassy path I looked around me, doing my best to be present to the beauty that was there, but keeping my eye out for any suspicious movement. Other fears crept into my thoughts. I was the only one on the trail in a secluded area, and I felt vulnerable. My critical mind chimed in too — the trail was too close to a highway; I wasn’t getting real “exercise”; the promised mile markers weren’t visible. Suddenly I spotted something long and brown on the side of the path. Aack! Could it be? Heart pounding, I started to back away, and then I realized it was just a pipe. That’s when I came to my senses, reasoning, “Hey, it’s 45 degrees out here. No cold-blooded animal is moving around right now!” I had totally overblown my fears about something that wasn’t even possible. Thinking about this, I came to a beautiful body of water. As I stood there trying to focus on being present to my current experience, I saw a huge bird fly up right in front of me. I had been so engrossed in my thoughts that I hadn’t even seen it standing there. We start with a clear vision of what we want. Then someone comes along and plants fears into our head, which can stop us in our tracks. While the intention of the man from the hotel was to keep me safe, if I had listened to him, I wouldn’t have gone on the walk at all. Very often, our first (and second, and third) attempts do fail. We need to keep going, and, to ask for help. That first morning, I couldn’t find the trail. I could easily have stayed inside the next morning and not tried again. However, I did try again. And, my second attempt only succeeded because I asked for help. We can misconstrue what’s really happening because of what we FEAR is happening. Along my journey, I was distracted from being present to the beauty around me because I was literally looking for those things that I feared. When I spotted that brown pipe, my heart was pumping as hard as it would have if I had seen a real alligator, because I thought it WAS real. The fear of judgment and rejection can alter our behavior. I allowed my fear of judgment to sully my experience of abundance and beauty in the moment that I stretched out my arms. The ironic part is that there wasn’t even anyone there to judge me! Yet I acted exactly as though there was. What started as a simple walk in nature turned into a rich opportunity to observe myself and see how easily I let minor obstacles deter me from creating an abundant life. So here’s a question for you: Where in your life do you let those challenges — real and imagined — keep you from living your best and most joyous life?